At the University of Rochester, I studied The Mathematics of Origami through my self-designed BA in Artistic and Mathematical Space. Origami vs. the Compass and Straightedge focuses on origami-based solutions to two classical problems that were proven to be unsolvable using the compass and straightedge. All origami forms begin with basic folded shapes called bases. The traditional bird base in origami is shown in figure 1. It was first recognized by Peter Engel, an American origami artist and mathematician, that the unfolded traditional bases share a geometric module. 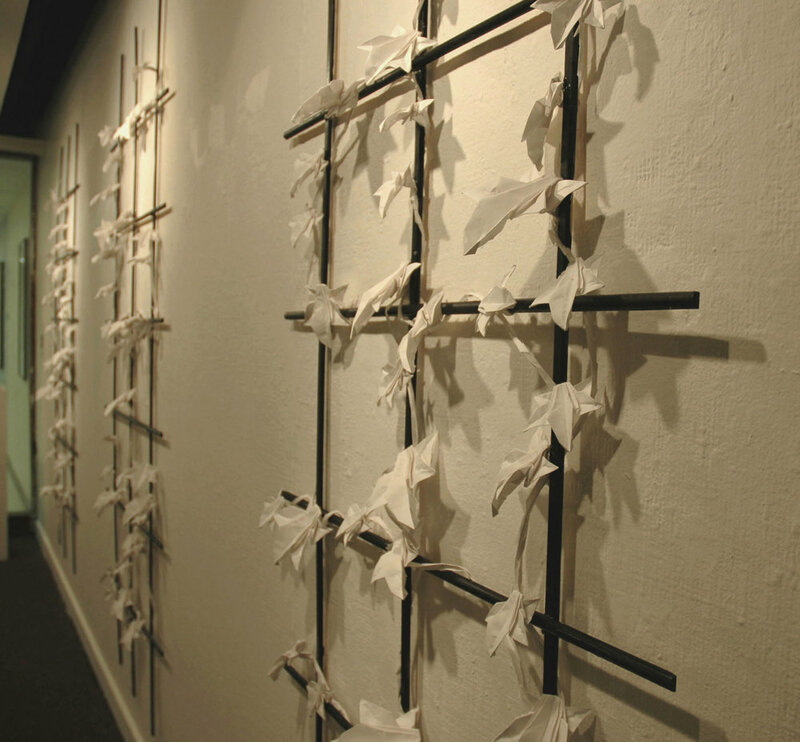 An origami module is a fragment of a creased origami piece, unfolded. A crease pattern is what remains when one folds and unfolds a clean sheet of paper. The module can be seen repeating in the unfolded creases of the base shown below in the shaded triangle. Since each of these geometric patterns are self-similar, Engel found origami folds to be fractal. Each circle inscribed in the unfolded bird base represents a flap in the folded model. 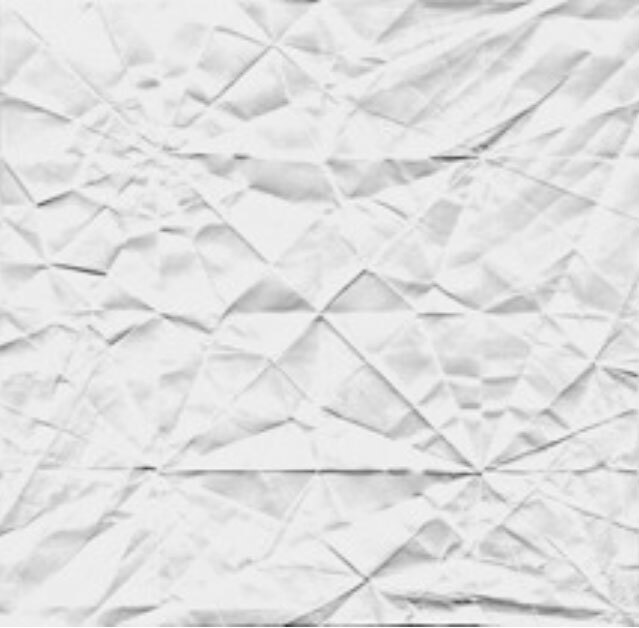 A flap is a region of the paper that can maneuver apart from the rest of the folds. The length of the flap is represented by the radius of the circle. Therefore, any flap can be represented by a circle, so long as the center of the circle is inscribed within the origami paper. In the traditional bases, none of the circles overlap. This is because the radius of the circle affects the length of a flap it represents. If circles were to overlap, the radius of the circle, and therefore the length of the flaps, would be shortened. The circle is then shorter, which directly affects the resulting length of the flap. 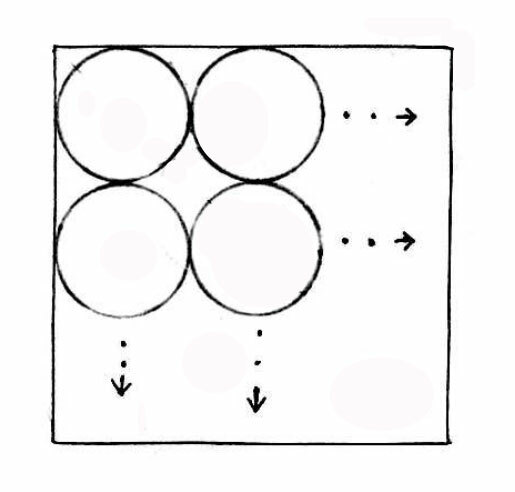 With circle packing, it is theoretically possible to create a base with any number of flaps. This is mathematically easy to imagine: The radius of each circle would equal 1/(2(N-1)) and the number of flaps would total to N². However, as N increases, the folded base would become increasingly complicated to fold. If the number of flaps on the paper were to approach infinity, the origami paper would need to become infinitely thin in order for one to actually fold the shape of the base. Origami flaps and bases are made by using different types of origami folds. In all cases, the order in which one chooses to fold the paper directly affects the shape of the base and width of the flaps. Even though two unfolded bases may have the same crease patterns, the folded results depend on the order of the steps taken to obtain the final shape. A sink fold is often used to narrow the width of a flap. The easiest sink fold is the spread sink, which is similar to the squash fold. The spread sink is often formed from a triangular corner, and is made by flattening the very tip of the flap while stretching the edges of the sides. The fold is complete when the model lies completely flat. Unlike the squash fold, however, the spread sink is made from at least two layers that are both simultaneously stretched/squashed together. Another form of the sink fold comes from reversing a corner that has four ridges, as shown in figure 4. This can be done by creating a preliminary crease to outline the area that one would like to have sunken in. This sink fold can be done several times to create double and triple (or more) sinks. "Prove that no matter how one folds a square napkin, the flattened shape can never have a perimeter that exceeds the perimeter of the original square." All circle packings lead to the design of bases. However, the bases cannot be folded without a constructive method to organize the folding sequences for each packed circle. For every two circles that touch, there is a crease connecting the centers of these two circles, and is called an axial crease. The axial creases come together in a single line. This happens for all polygons shaped by the axial creases. There is also a shared tangent line between touching circles. These are called hinge creases and connect to each other in paths running around each circle and stopping/starting on an edge. The points at which two circles touch are called tangent points and, like the axial creases, they end up piling together into one point when the base is folded. Lastly, there are ridgeline creases that are bisections of each corner of an axial polygon. Figure 6 shows the relationship between these creases on the frog base. Base molecules are incredibly flexible. For example, one can change the radius of each circle to find a different length for each flap. This changes the entire shape of the folded model. In figure 7, the base of a crane is shown with different variations. Figure 8: Folding 3/8 of a given edge and 3/8 of a given angle. Any fraction that has a denominator of the power of 2 can be folded by halving the paper and sectioning off 1⁄4, 1/8, etc. However, it is not the most efficient method and litters the paper with unnecessary crease lines. The binary folding algorithm was developed by Brunton as a method of folding the fraction m/2ⁿ (m < 2ⁿ) in exactly n creases. (Lang, 2003c) This algorithm requires that the fraction m/2ⁿ be expressed in binary fraction notation. Once the fraction is translated into binary notation, one can use the two folding equations to measure the fraction of the edge. Given a side length j on an edge, one can fold the bottom corner up to j, giving a crease at ((0+ j)/2). Folding the upper corner down to j gives a crease at ((1+j)/2). Similarly, given an angle gamma, one can fold the bottom ray of the angle up to gamma to find ((0 + γ)/2) and the top ray down to gamma to find ((1 + γ)/2). Then to fold a fraction m/2ⁿ, starting from the least significant digit (the right of the fraction), simply fold down to the new crease for every 1 and up to the new crease for every 0 in the binary number. Binary fractions can be used indirectly to compute rational fractions as well. For example, the Crossing Diagonals method is one of many ways to incorporate the binary folding algorithm to find the desired length on a separate edge on the square. Using the binary folding algorithm, construct w = j/m, z = k/m on the left and right edges, and connect them to the bottom corners on the opposite side of the square. y = w/(w+z) and x = (1 – y) = z/(w+z). y = j/(j + k) and x = k/(j + k). Adding paper to either the border or interior of the base design can allow one room for modifying a set base of an origami fold. Both interior and border grafts give the folder extra room split the base of the model into toes, beaks or larger wings, texture and scales, or simple flat spaces. To add a graft to a base design, choose the area that would need extra paper. Then, calculate the exact amount of paper the section will need and add "strips" to the unfolded design. For example, the images in figure 10 and 11 show the border graft applied to the traditional bird base and folded crane. The width of the border graft in this example (measured from the center of the square) is exactly half the width of the entire crane base and is added to the entire border of the base design. The flying bird has a greater wing span, a larger tail and notable face, unlike the original crane. The bases created with circle and square packings can be condensed into tree graphs. In figure 11 and 12, a grafted frog base is shown with its equivalent graph. The lengths of the edges are equal to the weight of the leaf. One can use tree theory to work backwards -- from the layout of the graph to the design of the folded base model. The tree method of design guarantees that any piece of paper can be transformed into a base whose projection is the given tree. However, one must consider the proportions of the tree in relation to the paper. For instance, the frog base can be represented in several different scales. The scale factor of the crease pattern then becomes a measure of efficiency. The modern origami techniques can be generalized into six different folding axioms. These axioms were originally developed by Humiaki Huzita in 1992. Axiom 1: Given two points p1 and p2 connected by a fold l1, and two points p3 and p4 connected by fold l2, one can find the point of intersection q between l1 and l2. Axiom 2: Given two points, p1 and p2, one can fold p1 onto p2 to obtain a line l.
Axiom 3: Given non-parallel lines l1 and l2, one can bisect their shared angle by folding l1 onto 12. Axiom 4: Given point p1 and line l1, one can fold a line perpendicular to l1 that passes through p1. Axiom 5: Given two points p1 and p2 and a line l1, one can fold a line that puts p1 onto l1 while passing through p2. Axiom 6: Given two points p1 and p2 and two lines l1 and l2, one can fold p1 onto l1 while simultaneously folding p2 onto l2. In some cases, the 4th and 5th axioms are combined to form a separate axiom. This fold was originally proposed by Koshiro Hatori in 2003 (Lang, 2003c): Given a point p1 and two lines l1 and l2, one can fold a line perpendicular to l2 while bringing p1 onto l1. Axiom 5 and 6 are directly related to the formation of a parabola. For axiom 5, given a parabola with focus point p and directrix l, any tangent to the parabola is the crease one finds by folding p onto some point on l. For axiom 6, given foci p1 and p2 and directrices l1 and l2, one can fold a single line lt that is tangent to both parabolas (bringing p1 to l1 and p2 to l2). In general, compass and straightedge constructions are more restrictive than origami constructions. Each elementary compass and straightedge procedure can be replaced by the origami axioms 1-5. For example, the circle can be constructed by finding a length r to be the length of a flap represented by a molecule in the unfolded paper. Real, foldable origami only includes numbers which can be represented by a finite number of integers that are additive, multiplicative square root extractions. Such numbers, besides cube-root(2), are considered constructible with the compass and straightedge. The origami axioms can be used to construct any solution to (ax² + bx + c = 0), where a,b, and c are constructible numbers. The equation (x² - 2 = 0) can be constructed by folding the diagonal of a square with side length = 1, which is √2. The traditional bases have crease patterns that are formed with two types of right triangles -- the 45-45-90 degree triangle and the 22.5-67.5-90 degree triangle. Bothtriangles are used in axial tiling techniques. In fact, many origami designs use equations of the form (a + (b√2)) and subsequently, (1 / (a + (b√2))). A modified version of the crossing diagonals algorithm finds the reciprocal of (a + (b√2)); one diagonal gives the integer or rational portion and the other diagonal gives the portion containing √2. In 400BC, Greek mathematicians pondered over three problems. These classical problems were proven by the young mathematician Evariste Galois (1811 – 1832) to be impossible to construct using the compass and straightedge. Two of these classical problems require the solution to the cube root of 2, which can be solved with a cubic equation. Axiom 6 increases the set of geometric constructions that are possible with axioms 1 – 5. This shows that the constructions that can be made with the compass and straightedge is the subset of all origami constructions. Solutions to cubic equations, in particular, are not constructible using only the compass and straightedge. Axiom 6 can find the common tangents of two parabolas with foci p1 and p2 and directrices l1 and l2. The relationship between cubic roots and parabolas was well known in antiquity, and Descartes was aware that the intersection of two parabolas could solve simple cubic equations. To find the slope of the tangent of these parabolas, first fold perpendicular lines to represent the axis. Then, given a, fold a/2 to the left and right of the origin. The point where a/2 = x intersects the x axis represents the focal point p1 of u1, and the line –a/2 = x represents its directrix l1. Given b, fold b/2 above and below the origin. The point where b/2 = y intersects the y axis represents the focal point p2 of u2, and the line –b/2 = y represents its directrix l2. Find tangent line t by folding p1 onto 1l while simultaneously folding p2 onto l2 using Axiom 6. To find the cube-root(a/b), fold the unit length from any point on t parallel to either axis. Complete a right triangle with hypotenuse on t -- the third line segment has length –(³√(a/b)). To solve the Delian Problem, simply set a = 2 and b = 1.
cos(3a) = 4cos³(a) – 3cos(a). as well as the unit parabola u2 with focus p2(0, 1⁄2) and l2: y = -1⁄2. Since a is negative in this case, u1 will face to the left. By solving for the common tangent of these parabolas, one can easily find cos(a), which leads to the angle a.
Jacques Justin, a French folder and mathematician, found a method for folding obtuse angles that is less technical than the way shown above. (Lang, 2003c) His method only works when one is folding in the center of a square, and not along an edge. The Japanese folder and mathematician Tsune Abe also devised a method of trisecting angles (Lang, 2003c). His method can be applied to acute angles and, if needed, on the edge of a square. Combining the binary folding algorithm for angles along with angle trisection allows one to fold angles whose denominators are of the form 2ⁿ3m. Alperin, Roger C. “A Mathematical Theory of Origami Constructions and Numbers.” http://www.emis.ams.org/journals/NYJM/j/2000/6-8.pdf, 2000. Alperin, Roger C. “Trisections and Totally Real Origami.” http://arxiv.org/pdf/math/0408159, 2004. Edwards, B. Carter; Shurman, Jerry. “Folding Quartic Roots.” http://www.jstor.org/view/0025570x/di021218/02p0058p/0, 2001. Field, Mike. “Mathematics through Art – Art through Mathematics.” http://nothung.math.uh.edu/~mike/mathartpub/math-art.pdf, 2002. Kappraff, Jay. Connections: The geometric bridge between art and science. New York, NY: McGraw-Hill, Inc., 1990. Lang, Robert. “A Computational Algorithm for Origami Design.” http://www.langorigami.com/science/hha/origami_constructions.pdf, 2003. Lang, Robert. Origami Design Secrets: Mathematical Methods for an Ancient Art. Natik, MA: A.K. Peters Ltdl, 2003. Lang, Robert. “Origami and Geometric Constructions.” http://www.langorigami.com/science/hha/origami_constructions.pdf, 2003.